While similar, hiking and trekking are two different activities, but both require similar management for people with diabetes. 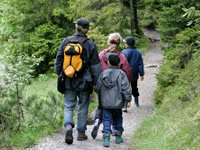 Hiking occurs on trails in beautiful natural environments, with pre-charted paths setting the way. These can occur at day or overnight. Trekking, meanwhile, number lasts a number of days on unchartered paths in challenging environments that include hilly or mountainous land. In terms of managing your diabetes, there are several aspects to consider in specific detail. However, differences between hiking and trekking are primarily based on how long you planned trip is to last. Insulin will last roughly a month at room temperature, but in hot weather and mid-summer trips, insulin can spoil much quicker. If the insulin is overheated, it may look normal but not actually function. This will eventually lead to the insulin becoming cloudy when it should be clear, however, the exception is NPH insulin which is cloudy in appearance. If hiking or trekking on warm days, keep your insulin out of direct heat and sunlight by storing it in the coolest places of your backpack. There are also a variety of cooling wallets available that can keep your insulin out of the heat. When hiking or trekking in cold weather which is around or below freezing, keep your insulin in a jacket, trouser or coat pocket to keep it warm. Insulin can freeze as well as overheat and will similarly fail to function as a result. Keeping insulin close to your body will prevent this from happening. Be sure to take enough injection needles to last the duration of your trip, as well as a suitable box or storage facility for used needles to be placed. Needles should not be reused, as a single injection can cause noticeable damage to the tip of the needle, making a second injection considerably harder and more painful when entering your skin. You may need to eat more carbohydrates than normal during your trip, with strenuous treks requiring around double your carbohydrate intake to handle the demand placed on your body. Eating whole grain foods, such as bread, pasta and breakfast cereals provide a longer lasting energy boost than snacks that rely on sugar for quick doses of energy. Whole grains digest more slowly, providing a more stable energy level on your trip, while fibre is also recommended as it slows down the absorption rate into your cells. Protein is also invaluable for longer treks. This can help your body maintain and build muscle mass as well as provide something else for your body to digest besides carbohydrates, which will help your blood sugar levels. People hiking and trekking with diabetes will find, most likely from trial or error, what form of medication management works for them. Assessing a general plan can be hard, as one may not be applicable to all. However, there are some basic tips for first timers than can prove helpful. If you are not used to hiking, you should consult your doctor before making drastic changes to your insulin routine, with trial and error necessary for many to find their own method of medicating. You should also not attempt a hike or trek for the first time by yourself, especially if you have been cleared to make radical insulin changes. People with diabetes, on either insulin, sulfonylureas or glinides, will find that strenuous days of burning calories can result in regular battles with low blood sugar that can require many breaks to correct. Exercising with low blood sugar can be challenging on a longer trek and lead to exhaustion as the days go by. Given the amount of calories you’ll be burning, you will generally not need as much insulin. You should also test your blood sugars frequently, as recognising high and low blood sugar symptoms can be harder when exercising at a relatively constant level. Keeping hydrated and drinking plenty of water will help you maintain all your endocrine functions (including insulin and glucose) a little easier. This can help your body keep things under control, with better production and absorption also fending off side effects, such as extreme thirst and dizziness, that dehydration can cause. Some blood glucose meters can under-read at altitude, particularly those dependent on a glucose oxidase reaction, while there is also a possibility of blood thickening at high altitude due to dehydration. It is therefore important to keep your meter and test sticks warm, which can be achieved by using insulated pouches worn under clothing and near to the skin. Cold hands can also make blood testing difficult, so keep your hands warm throughout your trip and try to use a large drop of blood to prevent rapid drying on the test strip. If you do not believe your reading is correct, warm your meter up by holding it under your armpit for a few minutes and try again. Alternatively, test your urine for glucose, as meters may be unreliable at altitude. Taking a back-up meter and batteries is advised as well as a larger amount of test strips than you think you would need. High altitudes can increase the need for carbohydrate, while the cold can suppress the usual mechanisms required for fat breakdown. Both situations can result in hypoglycemia, which is dangerous enough, but can also result in your body suppressing shivering, a normal reaction to the cold. This can increase the risk of hypothermia, which is when your body-core temperature is lower than 35°C. Those with type 2 diabetes who are treated by diet, exercise and the oral medication, metformin, are very unlikely to suffer a hypo while hiking or trekking. However, people on drugs such as sulphonylureas and glinides will be at increased risk of hypos. There are two options; one is to increase your carbohydrate intake before and at intervals during the walk, while the other is to reduce your dose before hiking or trekking. You should speak to your doctor and get their agreement before making any changes to your medication dose. Taking care of your feet is essential when hiking or trekking, so you should ensure your choice of footwear is as comfortable as possible. Granola bar or cereal bar?